There's nothing shabby about Derelict London, a thoughtful compendium of unloved and forgotten buildings, the necrotic ulcers in London's hidden underbelly. Photos from the author, some taken in locations where we wouldn't want to risk an expensive SLR, are backed up with illuminating research and tip-offs from fans of his web site. The book opens with a sorry tale. A ramshackle Victorian cottage in East Dulwich is in limbo - it is Grade II listed so cannot be pulled down, yet the owner is unknown, preventing restoration. Paul has photographed the multicoloured interiors of a row of Bermondsey flats, left open to the elements to discourage squatters. We read of the abandoned shopping arcade in Wapping, still sporting model pirates, and secret passages beneath the King's Cross lighthouse building. Special attention is given to the lower Lea Valley, which harbours dereliction on a suitably Olympic scale. The book closes with a section on buildings that have been recalled to life - the German Gymnasium in King's Cross and the South London Hospital for Women are two notable examples. But the fate of many buildings still hangs in the balance. Those are the places you will find Paul and his camera. "Even in the short time this book has been in preparation," he says, "some of the buildings shown will have inevitably been wiped off the face of the Earth, while others may well have been put on the road to recovery." Kudos to publishers Random House for backing and repacking a wonderful yet niche web site into book form. We hope the result is successful enough to spawn further volumes, with updates on the the first set of derelicts. 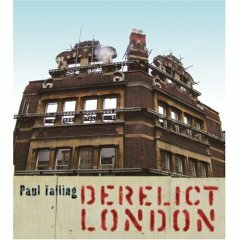 Derelict London is out today, published by Random House.